Welcome to Mythos Academy, where teenagers are being prepared for the world not only with a first-class education, but with the skills for battle and magic. 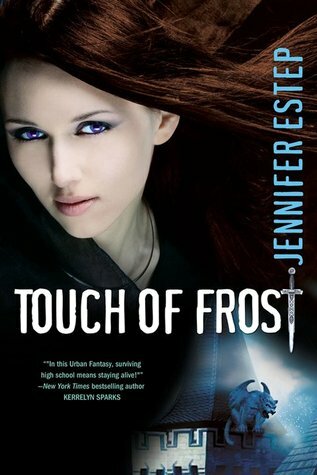 When a student is murdered and a magical relic stolen, Gwen Frost is determined to find out who is behind the deeds. Especially since she was supposed to be the victim. Gwen Frost may attend Mythos Academy, where even the geekiest kid is descended from a mythical warrior, but she is still an outsider. However her power to see scenes when touching objects does help to keep her out of too many peoples' ways. When one of her classmates is killed and a powerful object is stolen from the library, Gwen discovers that she may not be as much of an outsider as she thought. As a fan of YA books dealing with "underdogs" in school, I was not disappointed by Estep's book. Mythos Academy has the feel of many private schools, with a lot more Valkyries and Amazons thrown in. Gwen is fully formed, dodging bullies with her power while still being subjugated as a library staff worker. She shows an idealism that makes Gwen a strong, if flawed, young woman and her discoveries through the book about not only the murder of her classmate, but of her own heritage, present a lot of room for Gwen to grow. I really enjoyed the secondary storylines that set up Gwen's relationships with Daphne, Carson and Logan and I am excited to see where it goes next. Fans of the House of Night series by P.C. and Kristin Cast and Rachel Caine's Morganville Vampires will enjoy this.